The first biography written with Paul McCartney's approval and with access to family members and friends closest to him. Superbly evoking half a century of popular music and culture, Paul McCartney is the definitive life of a long-misunderstood genius. In this masterly biography, history's most successful songwriter, a man of seemingly effortless talent, beauty and charm, is revealed as a complex, insecure workaholic who still feels as great a need to prove himself in his seventies as when he was a teenager. 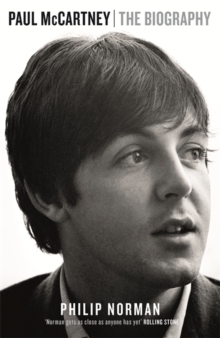 We learn how his boyhood was blighted by the death of his mother, Mary - later the inspiration for 'Let It Be' - but redeemed by his remarkable father, Jim, a Liverpool cotton-salesman who was his only music-teacher and whose influence has permeated his career. We understand as never before the creative symbiosis between John Lennon and himself that unlocked the extraordinary treasury of their songs for the Beatles when they were barely into their twenties, and the fierce rivalry which lasted beyond the band's break-up to the end of John's life - and still haunts and inspires Paul to this day. Here for the first time is the full story of Paul post-Beatles: his trauma after being brutally sidelined by John, George and Ringo over the appointment of their last manager, Allen Klein; his near-breakdown on his remote Scottish farm and dogged determination to build a new band, Wings, into as big a name in the 1970s as the Beatles had been in the 1960s. Here too is the first inside story of his marriage to Linda Eastman, much criticised at the outset but destined to become the longest and strongest in rock until her death from cancer. Here are the traumatic post-Linda years when his charmed life seemed temporarily to crack up: his whirlwind romance with Heather Mills ending after four years' marriage in one of the most expensive and rancorous divorces in British legal history. As richly fascinating and dramatic as its subject, Paul McCartney: The Biography is the last word on a man whose music has lit up the world.